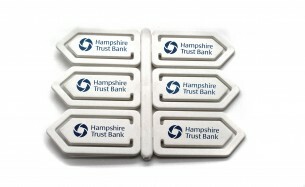 The promotional paper clip set comprises of six plastic paper clips attached onto a spool. We will digitally print your full colour logo to one side in a print area of 35mm x 12mm. A practical and cost effective give away novelty item. Available in a variety of colours; black, white, blue, green, purple, red and yellow. Minimum order of 250 units.